We already listed this phone on our post about Cherry Mobile Festival Sale 2014. Omega Infinity is the latest octa core powered Android smartphone from the company. This is also their second release of phone with 8 processors after the success of Cherry Mobile Cosmos Z2. Though we haven’t read any direct announcement of the release date and availability of this new phone, we are expecting this unit to come out in the market on this year’s fiesta sale. 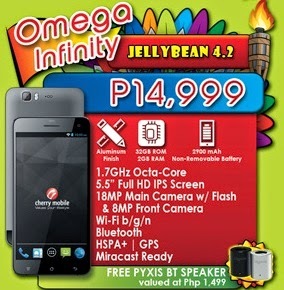 We’re listing few good features of Cherry Mobile Omega Infinity that leaves Cosmos Z2 a bit lower in overall package. This phone has a bigger screen size making it easier for you to touch and swipe on the screen unit. The Omega Infinity has 5.5 inch full HD display rendering you great colour quality and wide screen viewing. Since we haven’t seen the full specs, judging the price of the unit makes us expect that this also sports a scratch resistant Dragontrail glass. Cherry Mobile Omega Infinity has a bigger internal storage space that you can use for storing photos, music, apps and other files without spending extra money for memory card. The 32GB ROM for me is enough though you can fully utilize the indicated amount due to phone system files. The unit comes with a non removable battery of 2900mAh power capacity. Even if we doubt the battery feature as an advantage, we still consider this as a plus compared to Cosmos Z2. With you 15,000 pesos you can own this Android smartphone and get a free PYXIS Bluetooth Speaker that cost 1500 pesos if you buy it at separately.